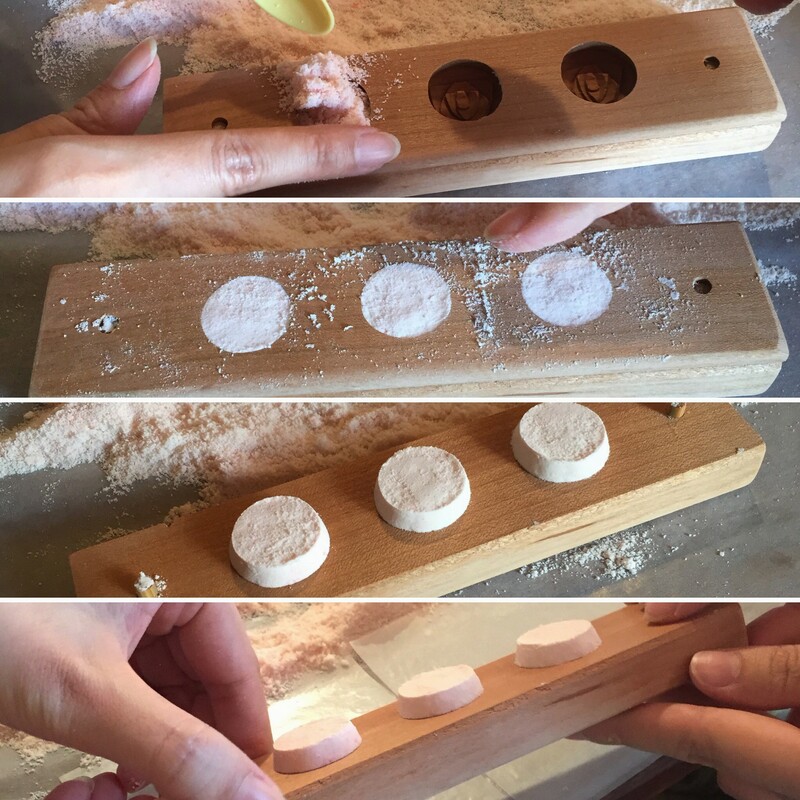 Last weekend I had the chance to attend a workshop making a special type of wagashi, or Japanese confectionary, called wasanbon. This particular type of wagashi is sadly becoming a disappearing art. One reason is because the primary ingredient is a special sugar (also called wasanbon) that is harvested in a cooler climate than other sugars, and takes a lot of work to refine. This high-grade sugar is quite light, and has buttery, honey notes that can’t be found in other sugars. Because of the special care in harvesting the sugar, it is quite expensive. Like the sugar itself, wasanbon molds are quite pricey. According to the workshop teacher, there is only one craftsman left in Japan making the wasanbon molds, and just the circular one pictured above on the far left costs over 30,000 yen (so just under $300 USD). On the bright side, you can find similar molds for about 3000 yen (or around $30 USD) at places like Kappabashi Dori, but the material and degree of craftsmanship will most likely be different. Next, our teacher began to mix the ingredients, which were super simple: wasanbon sugar, a teeny bit of water, and a teeny bit of liquid sugar. The liquid sugar, our teacher explained, makes the shaping process easier for beginners but isn’t absolutely necessary. She added a very small amount of pink dye as well, noting that if the end color is not subtle, wasanbon can quickly end up looking cheap. 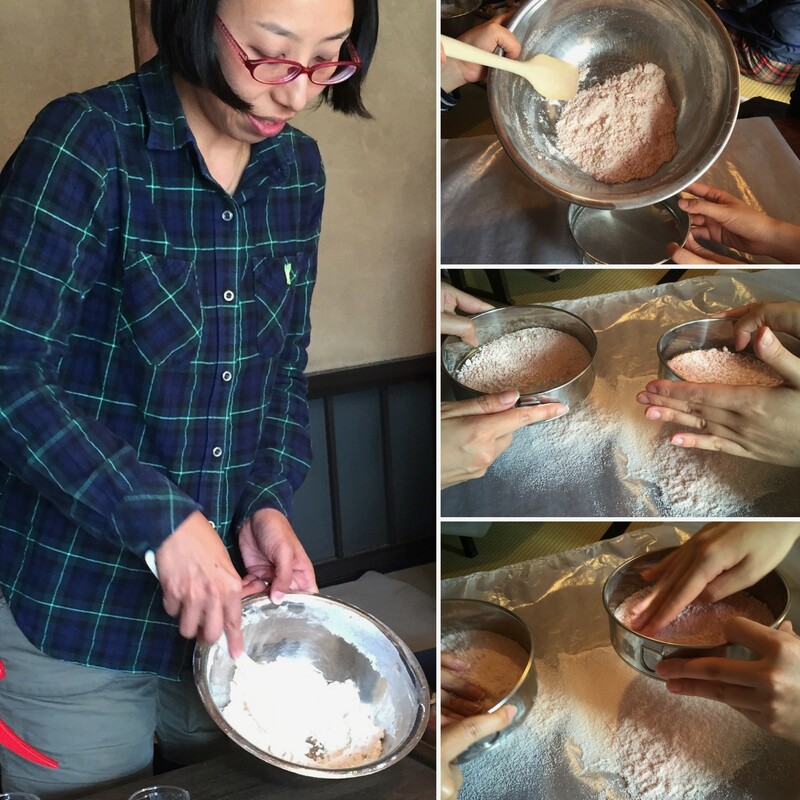 Once the mixture reached a texture similar to the beginning stages of a crumbly flour, we sifted it–first by tapping the edges of the sifter and then by pressing the remaining mixture through with our hands. Next we pressed the mixture into a mold as tightly as possible. We scraped off the top so everything was even, and then tapped at the top layer of the mold to release half of each sweet. 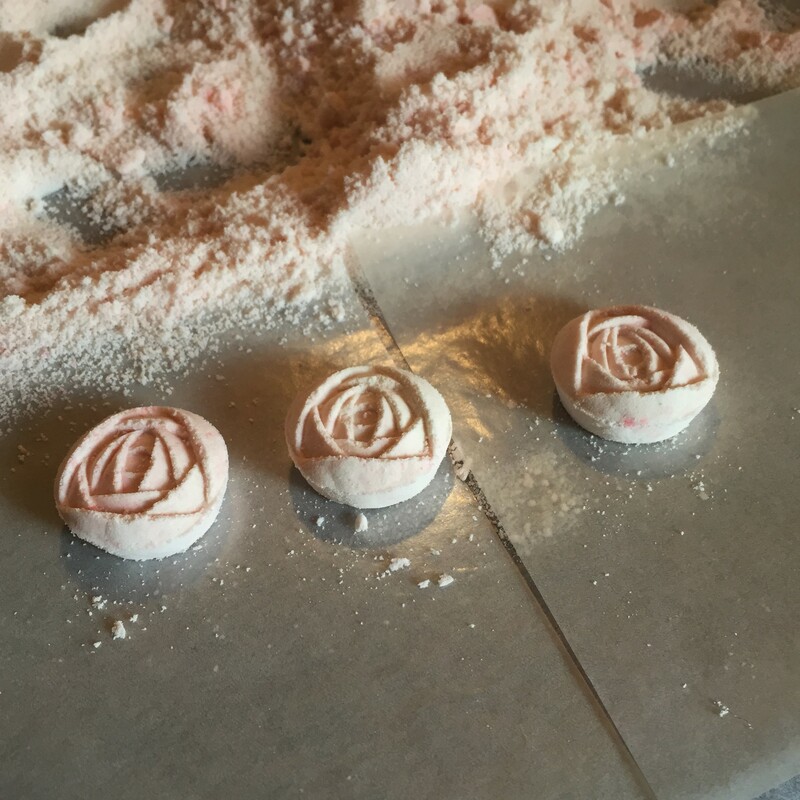 Lastly, we carefully flipped the mold and tapped as necessary to get pretty little roses to drop out. 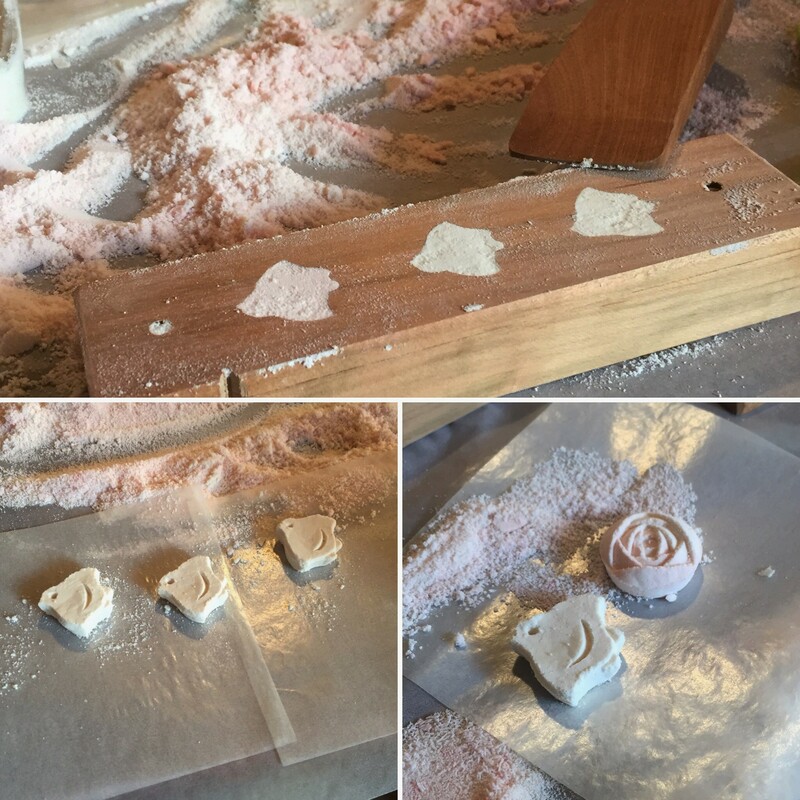 Flipping the mold was a little stressful, but on the bright side, the mold can always be repacked to try again (whereas if you add too much liquid to your wasanbon in the mixing stages, you can easily ruin everything–an expensive mistake!). We also tried using a bird mold, which I totally thought was some sort of fish at first (don’t tell). Finally, we got to try our creations. Our teacher instructed us to place a wasanbon on our tongue and just let it melt. The wasanbon initially felt light on the tongue, yet thick like frosting. The complexity continued as it melted, giving a distinct sweet flavor that vanished too quickly to hold on to. 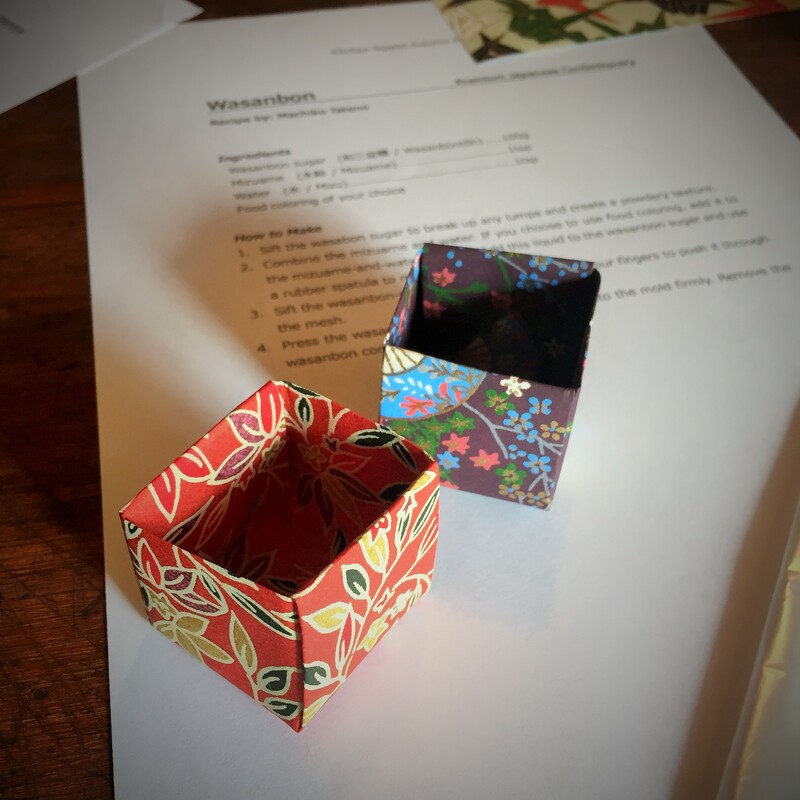 I really learned a lot from the wasanbon workshop, and hope I get a chance to attend workshops teaching other wagashi styles before we leave Japan again! Have you tried making anything new lately? Happy Monday! After a weekend of being sick, I managed to get my haircut and attend an hour workshop and not a whole lot else. I was really worried today was going to be a terrible start to the week after a very restless night (runny/stuffy nose, sore throat, being uncomfortable from my changing body, having to pee all the time…), but it was a surprisingly good day at work. At the moment I’m waiting for some rice to finish in our rice cooker so we can enjoy some takoraisu for dinner, so I thought I’d show you the needle felts I finished over the last week or so while I wait! 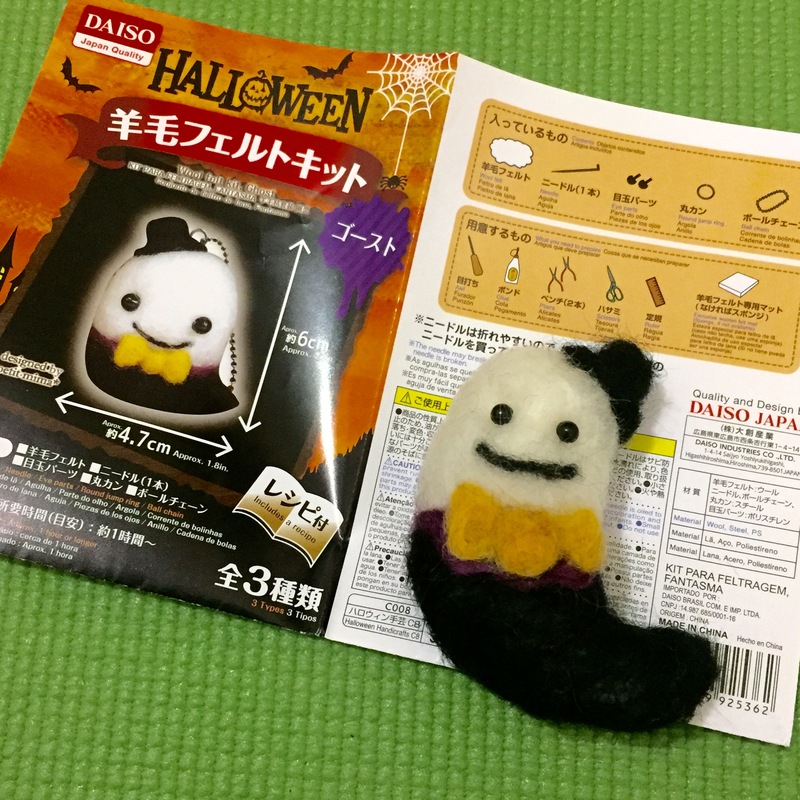 The last needle felting I did was a while ago: a little bee, and a bit before that a cute little onigiri. Both of those were not kits, but the ones I chose for Halloween this year were! I think there are some pros and cons to choosing kits rather than making things on your own, so I’ll tell you about the kits I got! First of all, these were both purchased at a 100 yen shop. 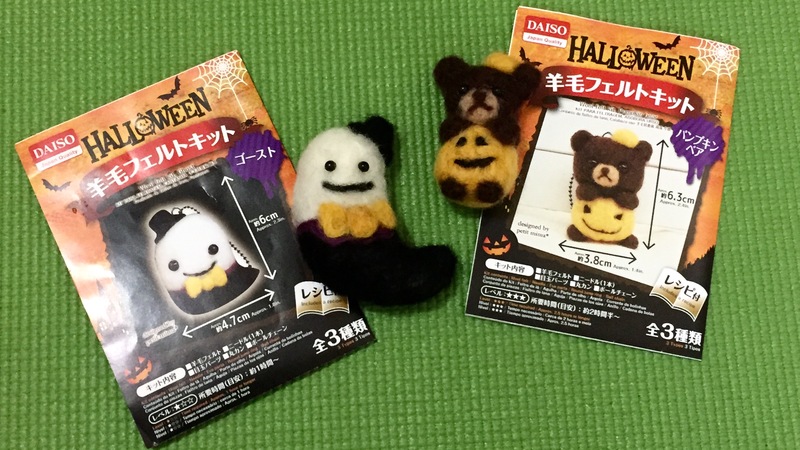 That’s right: for 200 yen total (less than $2), I got several hours of stabbing fun. Included in each kit was a needle, assorted felt for the project, eye parts, a round jump ring and a ball chain . Things I needed to prepare were glue, scissors, and a mat to work with (the kit also suggested an awl for poking holes for the eyes, pliers to insert them, and a ruler, but I just poked holes with my needle and inserted the eyes by hand. I also didn’t measure anything, but in retrospect probably should have!). I was a little disappointed my bear and ghost didn’t turn out as cute as the ones in the pictures, but I think part of that can be chalked up to lack of experience, part to not having the natural Japanese talent for making everything ridiculously cute, and part to not measuring *ehem, ehem* I was also a bit frustrated at having a limited amount of felt–I wanted to make my bear fatter (and thus cuter), but ran out of brown felt, and I wanted to cover the ghost with more of the black so less white showed through, but ran out of the black felt. Something cool I forgot to mention is that each kit came with a “recipe” written in both Japanese and English. This would be awesome if you were trying to study Japanese, and in my case (since I have been really naughty and haven’t studied at all lately) if you just want the English. 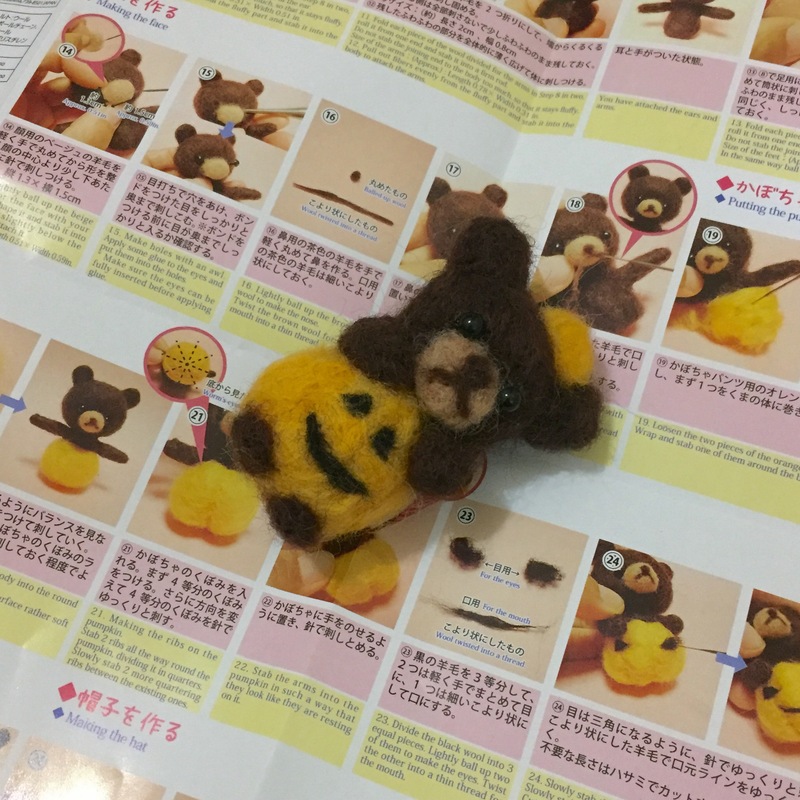 I think if you just want to try needle felting, a nice cheap kit like the cuties I got are a good way to go. Plus, once you’ve got a needle, all you really need is felt, a styrofoam mat and your imagination and you can do quite a lot! Well, dinner is calling! Hope you have a nice start to your week, too! We have been having a nice, relaxing weekend here in Tokyo, and I’m really not ready for it to end! I’ve been spending a lot of my time this weekend cleaning, reading, writing letters, and catching up on my art journal for the last week. I can’t believe I’ve nearly filled out my journal for an entire year now! Almost every time I finish a week of my journal, I look back through pages I made before. I thought it might be fun to share some of my favorites with you that I hadn’t posted because we hadn’t announced baby Dykehouse yet. 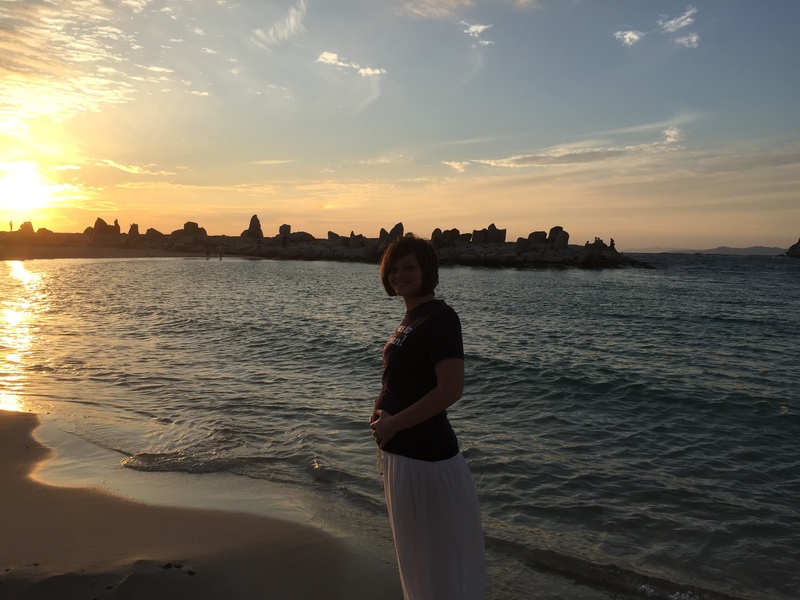 AND, just to make things more exciting, I thought I would intersperse some interesting things I’ve learned while being pregnant in Japan. So…I hope you enjoy it! I like the page above because it includes the day I found out I was pregnant. I just had a feeling, and my feeling was right! In Japan, before you can go to a hospital or see someone to become your regular OB doctor, you have to confirm your pregnancy and get a referral letter. So, we went to a clinic one day after work and I got an ultrasound. We confirmed the pregnancy to be about 5 weeks along, but baby was too small to see. I had to wait almost an entire month until my next appointment, but in the meantime I was off to my local ward office… I like the “favorite ice cream color palette” on this page, as well as my zentangle practicing. Pregnancy is not seen as an illness in Japan, and therefore it is not covered by health insurance. On the bright side, the government does give you coupons to help pay for the costs of visits and delivery, which is why I needed to go to the ward office. When I was there, they also gave me some face masks (thanks?) and a cute little maternity key chain to carry around so people will (sometimes) give up their seat on the train for me, and just be careful around me in general. This is half of a week in August, with the other half pictured below. Once a month I use washi tape to add a calendar page for the month from the cute kitty calendar Chad got me for Christmas last year. I can’t wait to see our sweet kitties again! Speaking of things not covered by insurance, there is one big thing that I’d like to point out: epidurals are not covered by insurance, and many hospitals are very reluctant to offer them at all. I really like my hospital overall, but one thing was made clear to me from the beginning: they encourage natural birth, and only give epidurals if you’re in severe pain for a prolonged amount of time. I hadn’t really thought about how I’d like to go about giving birth yet, but it’s kind of a bummer that for some things you just don’t have a choice. Other non-optional things at my hospital: The husband can’t cut the umbilical cord, the husband must stand next to his wife during labor and birth, you cannot donate cord blood, and they sometimes kancho you. Here’s the other half of that week in August, including the sad day our flight was delayed for 13 hours (but at least we were on vacation!). Yes, you read that correctly. K-A-N-C-H-O. Which means you will get everything (*ehem* poo *ehem*) out before delivery. Some hospitals in Japan are different and allow different things, according to some of my friends who’ve had babies here. I do I wish I had more of a say about some things, but my hospital has been voted to be one of the best in the country, is an international hospital, and seems to be efficient. So, I’ll go ahead and just do my best through this crazy thing called pregnancy. I really enjoyed attempting to draw food from our Thailand trip on this page. Speaking of my pregnancy specifically, it has been going really well overall. During the first trimester I was tired, was often light-headed, and felt nauseous frequently, but overall I was just thankful and happy for every doctor visit that reassured me baby was healthy and everything was okay. And during the second trimester, a lot of crummy symptoms came along according to the week they’d be listed on any pregnancy website or book (so hello occasional leg cramps and heartburn, etc. ), but we also got to feel baby kicking for the first time! These days she’s moving all the time, and at our last appointment we got to see her lovely profile. This week Chad got to come with me to a doctor’s appointment, and we got our first inkling that baby is a girl. We spent a really nice afternoon together after the hospital visit. I’ve still got about a week left before I hit my third trimester (already! ), but I’ve generally been feeling like a happy momma-to-be.Time flies and any discomforts so far are quickly forgotten a midst my gratitude. That’s not to say I don’t have my moments where I’m like, “Holy cow I’m actually going to eventually have this baby and it’s going to be painful and I hope everything is healthy and that we can prepare the best we can but will the doctors speak English enough on the actual delivery day and what if there are some weird things that come up that are different in Japan that I forget to ask about and and and…” BUT! We’re talking how I feel overall. And that’s good. Comforted and encouraged by my awesome husband, and thankful for a healthy pregnancy so far. Well, I’m off for now! Enjoy the rest of your weekend! Happy Tuesday everyone! I had a super busy weekend in Kansai, which included a lovely Saturday in Kyoto and a baby shower in the Osaka area on Sunday (you can see a few pictures on instagram). We spent yesterday back in Tokyo, and although I was bummed to come back at first, it was a good thing I got some rest as I’m feeling kind of crummy today. One the bright side, tomorrow is my next doctor appointment, so I’ll get to see our sweet baby again! And speaking of baby, some of my Fall Bucket List this year is all about preparation for when she joins us this January. You might notice this year’s list is a bit shorter than years past, but that’s mainly because in the past I baked a lot (still no oven in our apartment *cries*), went to events in Michigan (like the Detroit Beer Festival), or did Michigan-related outdoors things (like apple picking!). Also, some of this year’s list will actually take a lot more time, such as planning for the holidays and maternity leave! Should be fun working through this year’s autumn list. What do you have going this fall? 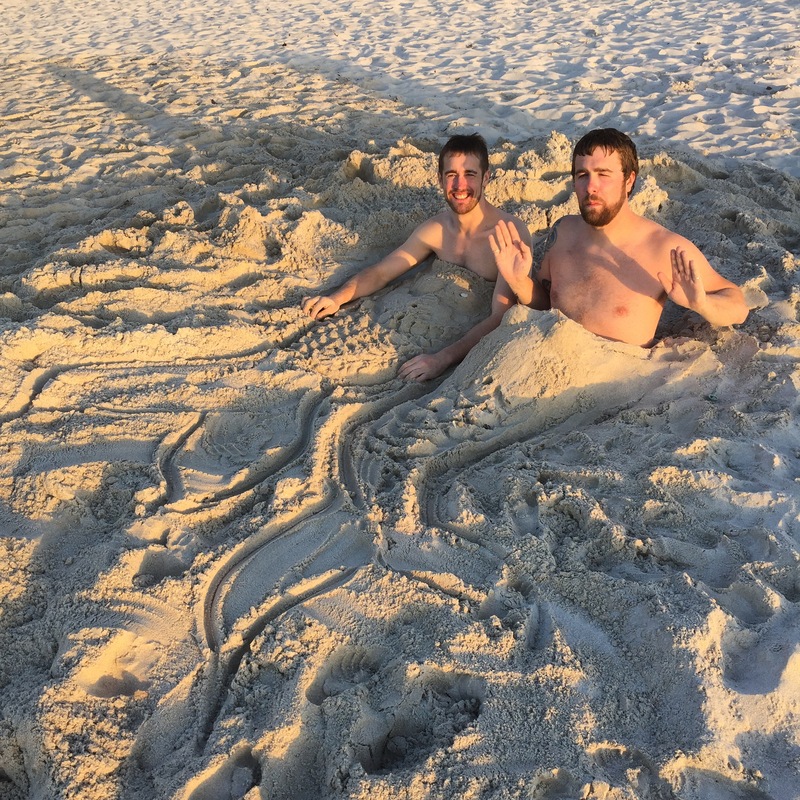 Now that we’re several days into fall I think it’s time for an update/recap on my Summer Bucket List for this year! Read at least three books [√] — Check out this Bookspiration post to learn more! Do yoga at least 4 times a week [X] — I thought I was going to be one of those glowing, energetic pregnant women–HA! But I have been walking every day, and I try and squeeze in yoga and other exercise when I’m not dead from work. Celebrate our 7th anniversary [√] — We went to Hakone and really enjoyed the Open Air Museum (read more here). Try paper quilling [√] — I made a pretty sunflower card and really enjoyed the craft (see my card here)! Eat s’mores [X] — You know, I didn’t get around to s’mores this summer. I did, however, enjoy a lot of early-released fall treats, so I think I made up for it! 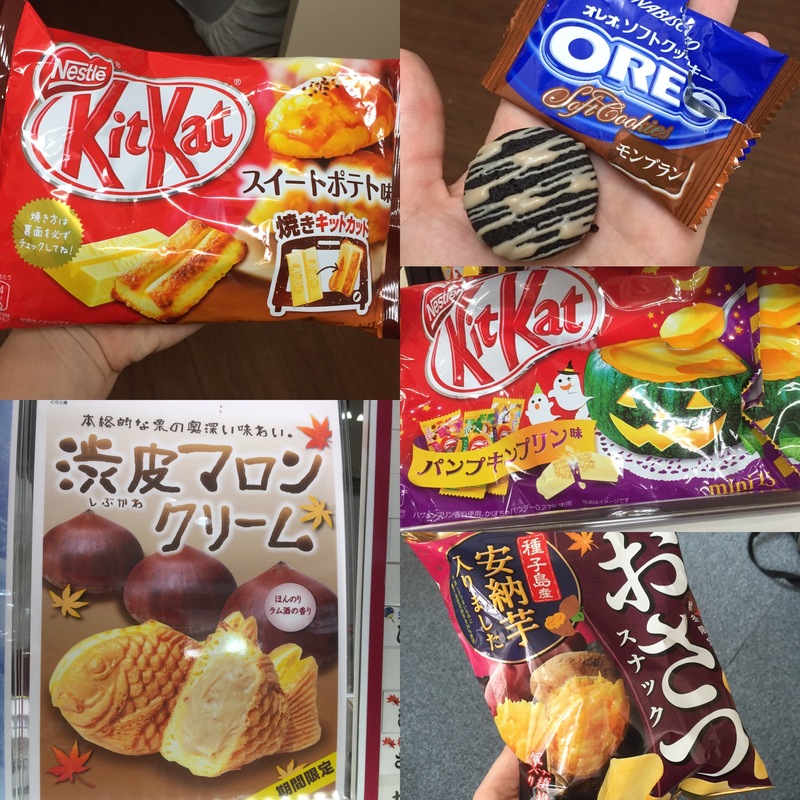 Left: sweet potato Kit Kats and chestnut flavored taiyaki; Right: chestnut flavored soft oreos, pumpkin flavored Kit Kats, and sweet potato chips. You can heat up both the types of kit kats. I didn’t try them warm, but they were yummy as is! 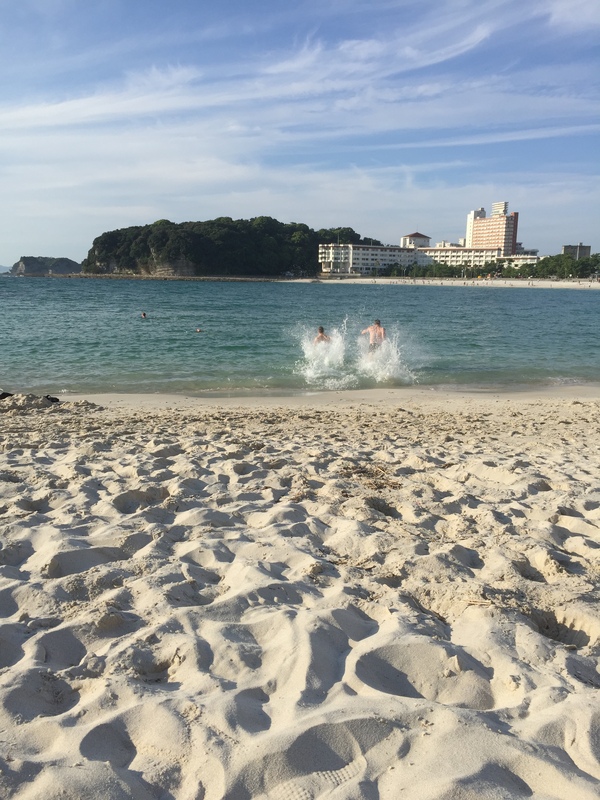 Go swimming [√] — I was lucky to go swimming in a hotel pool during our Thailand trip, and then again at Shirahama Beach with Chad and his brother Quint. Chad and Quint running into the gorgeous water. Make a hot air balloon craft [X] — I had all the best intentions, really. But I’ll be working on an easy one this week. Try kirigami [X] — Once again, good intentions on this one. It’s been moved to my Fall Bucket List, though! Go to Studio Ghibli [X] — Oh my goodness you guys. It is impossible to get tickets on weekends or on any other days we have off. I will keep trying again and again until we leave Tokyo! 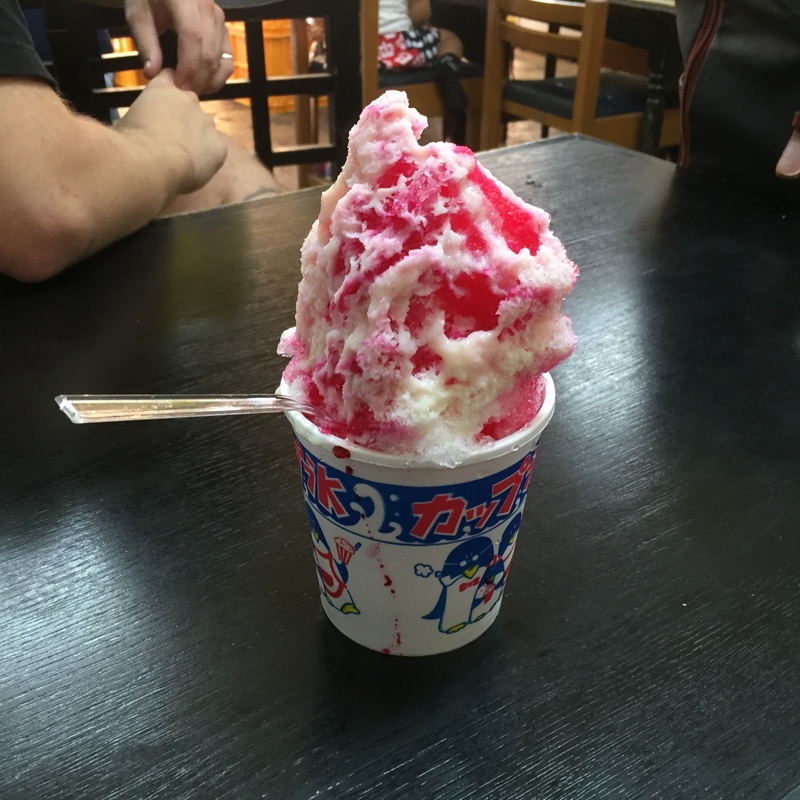 Enjoy kakigori (Japanese shaved ice) [√] — I had some lovely strawberry milk kakigori after visiting Sandanbeki Caves with Chad and Quint. Above: One view from the caves. The “milk” was actually sweetened condensed milk. Mmmmmmm….! 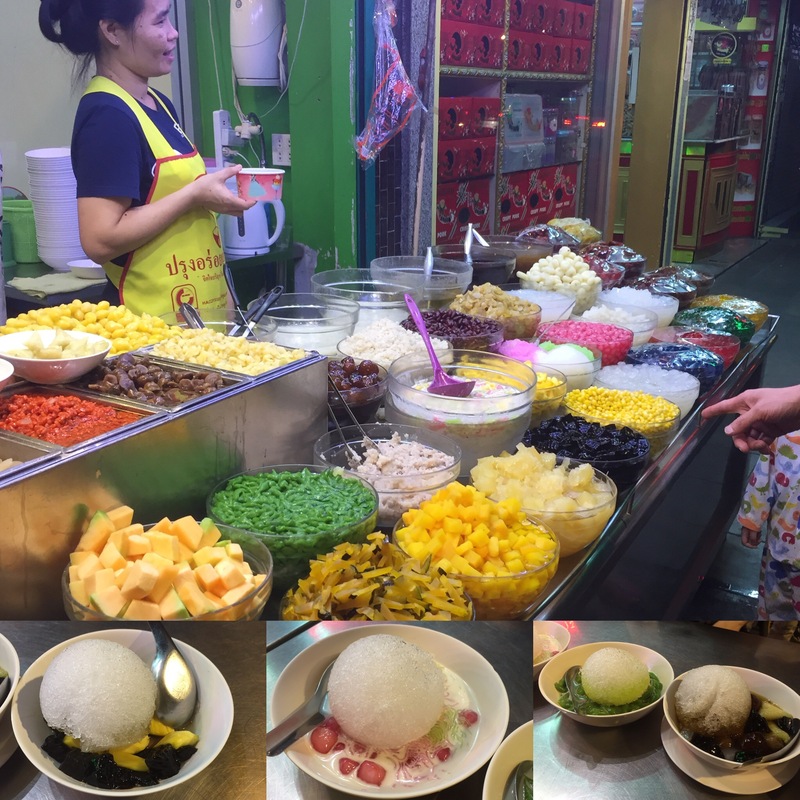 I also tried a totally different version of shaved ice in Thailand called “Ruam-mit.” My Thai friend says that means “mixing everything together.” Below you can see the stand with choices you can make for your own bowl, and then the four different bowls we sampled with our friends. We liked the ones with coconut milk the best! Have a fancy night dressed up around town [√] — Um, do you remember when we went to Chez Olivier? We actually went back again when Quint was here, too. 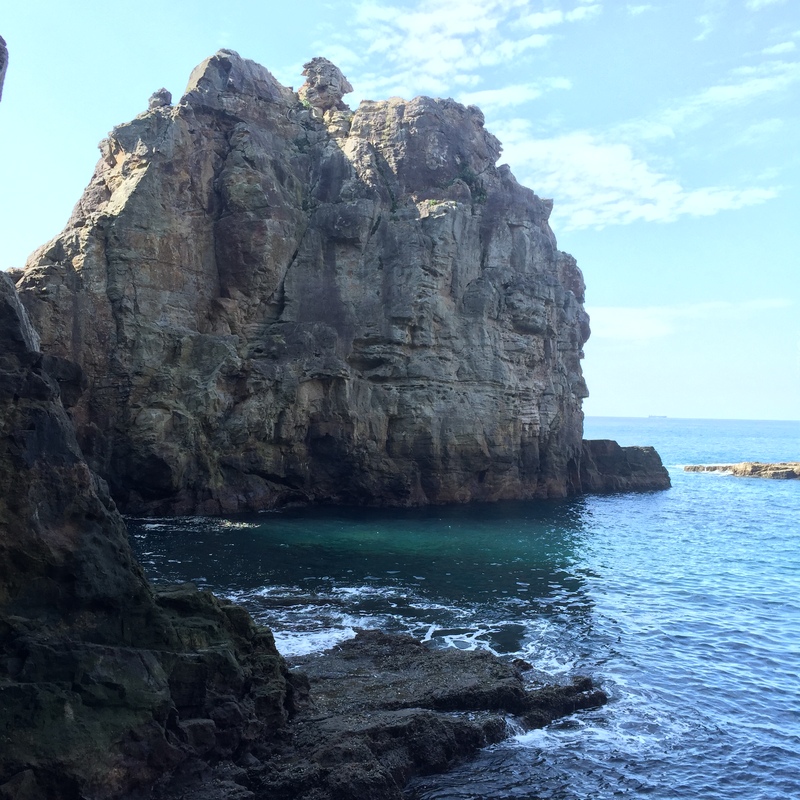 Still drooling at the thought of both visits…. Do at least 3 Writing Prompts [X] — I did one writing prompt, and really didn’t like it. Time got in the way of trying for another two. See fireworks [√/X] — So I didn’t actually see live fireworks, but I did do a really cool craft with my students. Here’s the link on pinterest! Do pirikura [√] — As you know from my last post, I totally got down with this one and used it as a baby announcement! All in all I’d say I gave this year’s bucket list a pretty good go, especially considering I was primarily in my first trimester for a good chunk of it! My fall bucket list is ready now, too, so I’ll be sharing that soon! What are some fun things you did this summer?